Sum who dominated this event in 2013 and 2014, picked up where she left off last season when she finished well ahead of the field in the women’s 800m race. She showed her intent early, trailing the rabbit closely before accelerating over the last 250m. Compatriot and training partner Janeth Jepksogei trailed Sum closely until the last 100m, She finished 3rd. It was a very close finish in the men’s 1500m. The rabbit took off at a very fast pace and only Nixon Chepseba tried to keep up with him. Silas Kiplagat and the rest of the field wisely stayed far behind. Kiplagat who topped the standings in this event last season, took the lead on the back stretch of the last lap. He was well ahead until the last 50m when the field started to close him down. He held on to win in 3:35.29. Hillary Ngetich and Collins Cheboi took 2nd and 3rd positions. If there has been any event that has been thoroughly dominated by one person in the past year or so, it is the 3000m steeplechase with Jairus Birech. And Birech was up to his usual dominant self when he finished 40 metres ahead of the rest of the field. And it was a strong field with runners like Paul Kipsiele Koech who finished second and Brimin Kipruto who finished 6th. 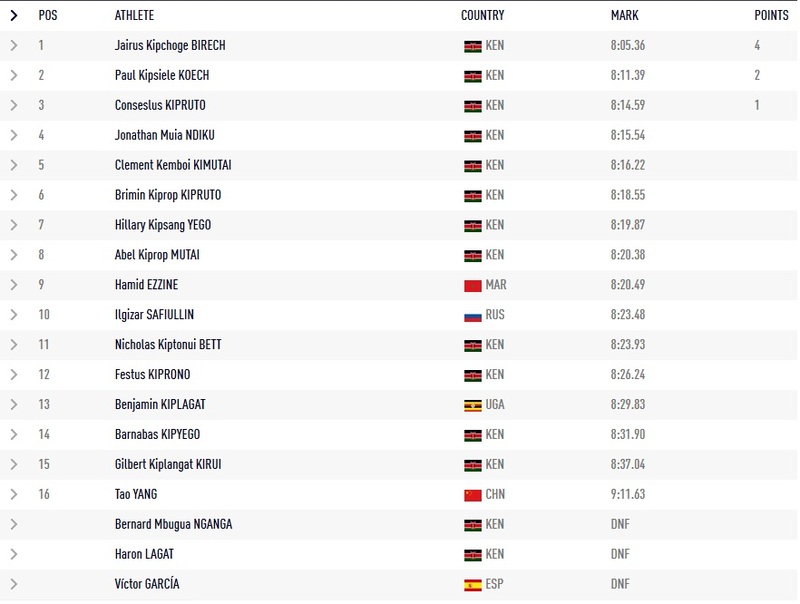 Kenyans occupied the top 8 positions. 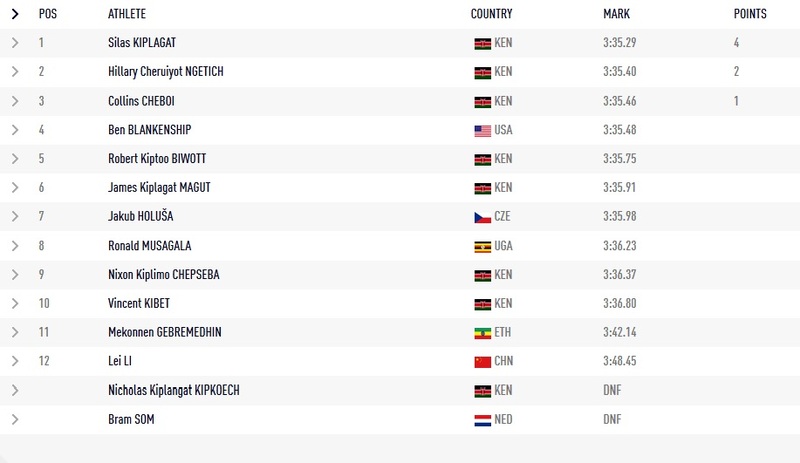 More good news for Kenya fans is that Conselus Kipruto finished 3rd. The 20 year old Kipruto looked very promising when he won the silver medal at the 2013 world athletics championships behind Ezekiel Kemboi. But he completely dissappeared in 2014 and there were fears that his career was dissipating. He has come back strongly and appears on his way back to the top. The indefatigable Paul Kipsiele Koech is still going strong at age 32. He has been competing as a professional for 14 years and is still world class. This entry was posted in Kenya Athletics News, Kenya Sports news and commentary and tagged conselus kipruto, Eunice Sum, jairus birech, Janeth Jepkosgei, silas kiplagat. Bookmark the permalink.